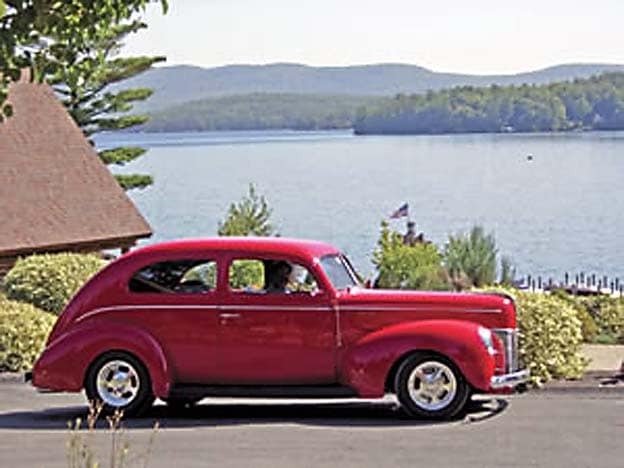 When America marched off to war, the ’40 Ford was waiting on the home front. One of the most influential cars of its era, the 1940 Ford, is subject of a new book. In the dark days before America was plunged into war, the nation’s smokestacks were finally beginning to belch smoke again, and nowhere was that more apparent than in Detroit, the auto industry finally ramping up after more than a decade of the Great Depression. It was an era of grand transformation as automakers began experimenting with more powerful engines, automatic transmissions, air conditioning and streamlined, often art deco styling. Some of the most striking designs emerged from the studios of Ford Motor Co.
Now Detroit Author Joe Cabadas—“in cooperation with The Henry Ford”— gives us a close look at the era leading up to the ’40 Ford in a new “coffee table” type book aimed at Ford enthusiasts in particular and automotive historians generally. 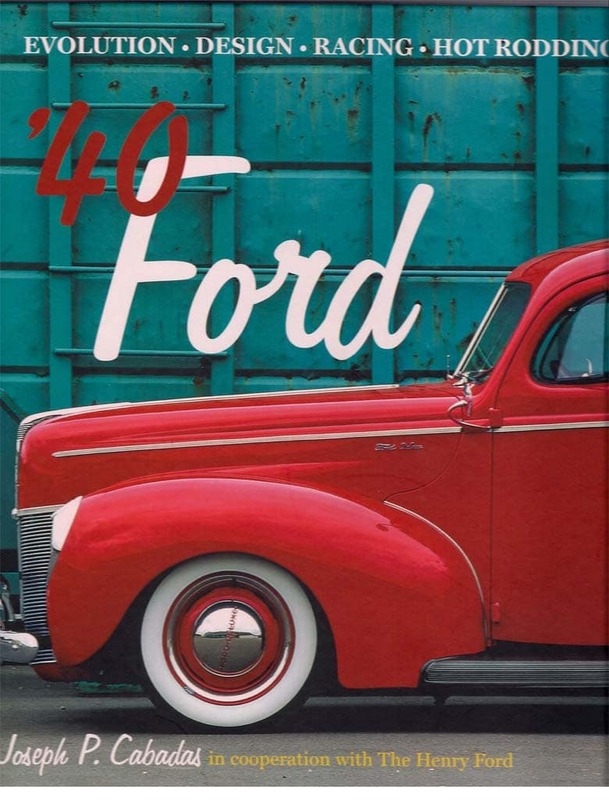 The somewhat short-changing title is ’40 Ford, a label dictated by publisher Motorbooks. In case you’re not familiar with the name, The Henry Ford, it’s the new handle for the long-known number one tourist attraction in Michigan, Henry Ford Museum and Greenfield Village. In any event, as a consequence of that cooperation between author, publisher and institution, ’40 Ford includes one of the largest collections of historic Ford photos, particularly from the 1930s, that I have seen published in one place. The accompanying history of Ford’s engineering, styling and manufacturing in that Depression decade of union organizing is full and very readable. Joe is a familiar figure at Automotive Press Association news-generating luncheons at the Detroit Athletic Club, the membership magazine of which Joe has also been a frequent contributor. Although Joe lives in Dearborn, home of Ford Motor Company, and truly has Ford blue in his blood, he has never worked for the company. However, his grandfather came from Spain for a job at Ford’s giant Rouge plant, once the largest automotive manufacturing complex in the world. Joe’s previous books for Motorbooks are American Auto Factory (2002) and River Rouge: Ford’s Industrial Colossus (2004), both also very liberally illustrated with rarely seen photographs from the Benson Ford Archives at The Henry Ford. Like ’40 Ford, they should be considered a must for any automotive history library. Buying them just for show on a coffee table would be a sacrilege. Getting back to the ’40 Ford title, it is short-changing because the book covers far more than just the iconic 1940 model that became so popular for racing and customizing. In detail, the book describes Ford’s V8 engine development and the accompanying “streamlined” 1937-1940 Fords that evolved from Eugene T. “Bob” Gregorie becoming the nucleus of Ford’s Styling (now called Design) Department in 1931. Eagle-eyed Ford fans may notice that a couple of late 1930s Ford Standard photos are misidentified in the book, errors known to the author too late to amend before publishing. Not many contemporary automotive enthusiasts may be aware that from 1938 to 1940, Ford offered two different front-end designs each year, one Standard and the other DeLuxe. The lower-priced Standard resembled the previous model year’s DeLuxe. A plus in this niche automotive history is description and images from Ford ‘s new model adventures in France, Germany and England during this period, when Ford V-8s were successfully manufactured and sold despite draconian anti-American car regulations, especially the dreaded horsepower taxes. Although I have considered myself something of an expert on Ford history, before reading Joe’s latest book, I knew little of Ford’s 1930s European products. 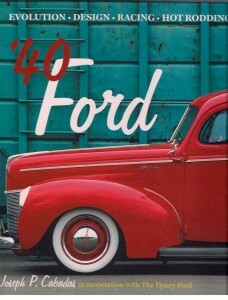 ’40 Ford, Motorbooks, 2011, 160 pages with a very complete bibliography as a bonus, $35 retail sticker price. You can order from Amazon for less, or stop by The Henry Ford museum shop if you’re in the vicinity. Full disclosure: I flyspecked parts of Joe’s manuscript before submission to the publisher. This entry was posted on Monday, July 18th, 2011 at and is filed under Automobiles. You can follow any responses to this entry through the RSS 2.0 feed. Both comments and pings are currently closed. Great stuff Michael. I look forward to the read.